Lots of different ways to restrain a bovine in order to get his physical adjustments made. I would prefer to work on an outfit that chooses to invest their money in a good crew as opposed to a squeeze chute or other forms of torture chambers. I’m not much on things made of steel, rubber and grease; I am more about men than machinery. A good crew can save a lot of extra work on the cow and get more pounds to the market place come shipping time. This crew will gather the cows at their home ground and hold them while they work their calves without the need for corrals or pens of any kind. This method allows the calves to stay with their mother while they wait to be processed; allowing the cattle to remain calm. Stress is a great weight reducer and this is not what the cow business is all about. After these cattle are branded and processed according to the owners wishes, the cows and calves are left in the hold-up to go back to their normal routine of harvesting the available forage. Every cow and calf is already paired up and no one has to waste time looking for their respective family member. They’re usually held up on their home watering and this allows everyone to leave full of water and get back to eating grass or browse as the animals so choose. This method doesn’t require special corrals, just a good crew. Now a good crew is very important and they must be dedicated professionals. They must be willing to spend the time to settle the cows and experienced enough to know how to enter the herd and catch the calves with the least amount of disturbance. These simple sounding skills are developed after years of experience and must be constantly practiced. Every man is of most importance to the success of this operation. Those individuals chosen to enter the herd and rope need to be the most experienced of the crew. They’re chosen because they can ride through the herd at a walk, never splitting a pair and catch a calf by the head or heels with one swing. This doesn’t happen watching TV. It takes years of knowing a cow in order to learn how to get in roping position. Every step a horse makes is important to the rope and to the calf and to the cow. How patient are you? Cattle soon learn this procedure and it’s important to teach them to accept your plan. Excess movement, missed loops and charging anger never pay off. The clock is always ticking when working cattle but a man has to remember that a cow moves seven miles an hour and not seventy miles an hour. Every move has a cause and effect; their’s a time to move fast but don’t be late making your move or it will cause you to spend much more time making up for your indecision or ignorance or drowsiness. 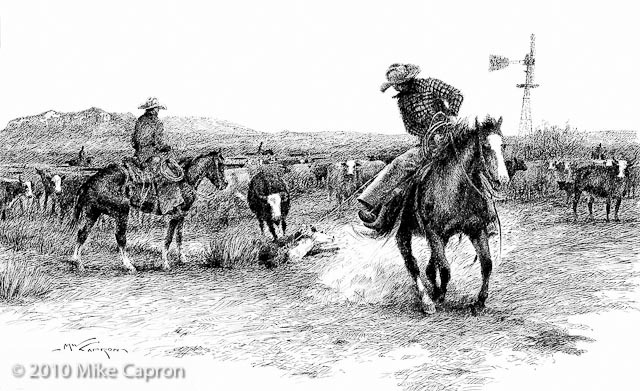 Young ropers were generally not given the chance to get in the hold-up. They had to wait until they proved that they could be trusted not to stir up the herd. Given the opportunity, the young roper may not be as good as the old hands but he would not be foolish and take bad throws either. He knew what was most important; do not stir up the herd.